Yup, that’s pretty much what that picture is. This baby was ridiculously happy all the time. He liked me too! What have you been doing that you haven’t told us? I know a little girl, a bit older than that baby but not much (she has just learnt to walk). The first time she saw me, she played with me, but the next time I saw her a few weeks later she was really quite scared of me, and has been ever since. She has been known to call me “mawu”, which is the name of a monster in local folklore! Thats just too adorable. His eyes are like little half-moons! hehe~ not only the baby is cute,John’s cute too, isn’t he? 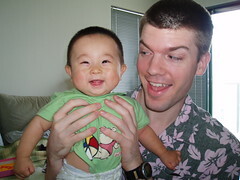 Todd raises an interesting point, though… at what point do Chinese babies learn to be afraid of foreigners? Of course, some never do. Those are the cool babies. I’m a surfer who came across to your blog from a listing. A very lovely site. And the Xiao Wa Wa [baby in mandarin:)] looks cute! Congratulations for having a happy (and healthy) baby that likes you. BTW, to me this baby has the typical face of a Shanghainese. Heh, just to clarify… he’s not my baby. Both his parents are Shanghainese, though, so he certainly is a Shanghainese baby. My facetious (and edited) comment aside, if John had a baby, it certainly would NOT look like the one in the pic. And to me, I don’t think the baby has a “typical face of a Shanghainese,” whatever that means. You’d find babies that look like that anywhere in East Asia, be it Shanghai, Seoul, Osaka, etc. Only by knowing ahead of time that the baby is from Shanghai would most people say he looks like he’s a “typical” Shanghainese baby. To me, the statement, “He looks like a typical Kyoto baby,” is just as valid. “Multiethnic,” I meant to write. Reminds me of this actor. All evidence to the contrary: all the chinese babies I’ve come across (and I’m talking about babies less than 2 y.o., meaning they haven’t been indoctrinated yet) have been seriously scared of me. All of them also started crying uncontrollably. It might have something to do with my height, though I doubt it. I have a baby daughter and I was away from Shanghai and doing my M.A. in Singapore. But I was there when she was born. Oh I should say the first time I saw her… it seems all babies when born look the same. After I came back from Singapore, I arrived home and picked her up, she looked at me like a very familiar friend (come on I am her dad) and didn’t cry. Now I try to be with her more because I want to make up for the time that has been lost. I go along with Da Xiangchang. Many years ago, when my oldest daughter was just a small tyke, perhaps a year and a half, when we attended church we quite often sat next to a man and his wife who were from Nigeria. There were not many blacks in that city at that time (and when I write not many, I mean not many in the extreme). Although we had many Asian firends (Japanese, Chinese, and Koreans) who came over to our home regulary, no Blacks. Anyway, at church my daughter would be frozen in place when she sat next to these African people, very terrified. I do not believe it is a manifestation of zenophobia at all, just a manifestation that some children are very cautious concerning things that are different (and for children, people are just other things). I think of zenophobia as conscientiously applied hatred for other people.